"Sean is an incredibly rhythmic player. He brings such a vitality, you couldn't miss it when he comes in. He's one of the best flute players of any age, that's playing anywhere in Ireland or America or anywhere else. He's absolutely fantastic," says fiddler Oisín Mac Diarmada, talking about Sean Gavin. As Michigan born Irish flute player Sean Gavin's star continued to rise, he attracted the attention of Mac Diarmada, best known for his group Teada and for his yearly Christmas In America tours. 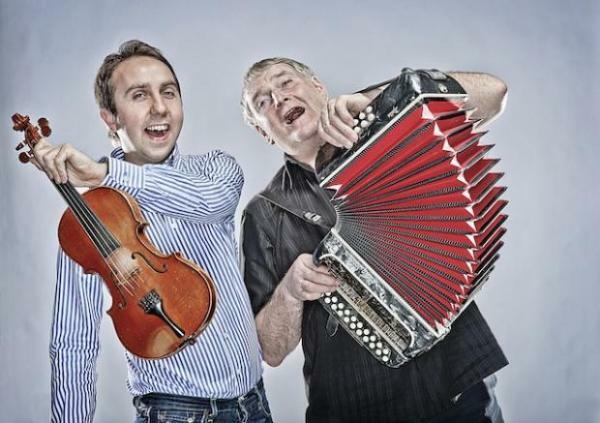 With legendary button accordionist and singer Seamus Begley, the flutist and the fiddler will play traditional music in the Richland Community Hall this Thursday. From a North American perspective, Ireland seems small--about the size of Indiana. But Oisín Mac Diarmada says his regional style of playing is quite different from that of Seamus Begley. They began playing together a few years ago. "We're from very different parts of the country, Seamus being from all the way down there in west Kerry, and I'm from Sligo. So we don't live nearby, and we're also coming from a different generation. But it's the great thing about the music, that it brings people together. We actually bring quite a different repertoire, from one end of the country to the next, so that's been lovely for me. I think that's one of the really nice things about collaborating with different people is that they put you in a different space. Seamus is very generous, he's very easygoing, so it hasn't been hard work at all for the two of us to sit down and do that." Seamus Begley started playing for dances as a teenager in the 1960s, and today is renowned for his joke-telling and electrifying playing in front of a live audience . But once in a while, he sings a show-stopping song in a soulful, high tenor which takes the music to a deeper place. "If you meet him during a boisterous night and if you haven't had the opportunity of hearing him sing, it sometimes causes a lot of surprise to people to hear him singing. Because he sings so sweetly, so softly, so gently. And then, when he explodes into action in the middle of a great night, he's anything but very soft and gentle! So it's wonderful. He's just a great character. He's the kind of man who has a great appreciation of fun, a great appreciation of sociability, having a good time with people, and winding them up, telling jokes. But he's not always like that. He has these times when he's in these more reflective moods. Which is good as well, because to go on a few-weeks tour, to give it that energy and excitement all the time, it would wear a performer of any age out. So he's able to mind himself and have the quieter nights as well. But when he's on fire, there's no missing him, and everyone always loves it." In a special appearance, Connemara dancer Brian Cunningham will join the musicians on Thursday night. He's known as a sean-nos dancer, an old style that predates the hard-shoe, stiff-body dancing popularized by Riverdance. "There is a fluidity of movement in terms of the arms are not wedded to the lower body, so there is that lovely hand and arm movement going on," says Mac Diarmada. "You see Brian's head moving along as he dances. It's very natural-feeling." The concert begins at 7:30 pm. For more information, email Cara Lieurance at cara.lieurance@wmich.edu or call 269-387-3167. Tickets are $10 cash at the door. All proceeds go to the artists. CDs will also be available. The Richland Community Hall is on M-43 in Richland, across from Hardings supermarket. Niamh Ni Charra New Album "A Tribute to Terry "Cuz" Teahan"
Sullivan Artist-in-Residence Seamus Connolly, director of the University’s Irish Studies music programs, will receive the Ellis Island Medal of Honor from the National Ethnic Coalition of Organizations (NECO) this Saturday in recognition of his distinguished career as one of the world’s most respected master Irish musicians. The Ellis Island Medals of Honor annually pay tribute to the ancestry groups that comprise America’s unique cultural mosaic. The medals are presented on Ellis Island to American citizens for their outstanding contributions to their communities, their nation and the world. Past Ellis Island Medal of Honor recipients include six Presidents of the United States, Nobel Prize winners, athletes, and leaders of industry, artists and others whose work has made a lasting impact on humanity. Actress Mia Farrow, recording artist Dionne Warwick, Surgeon General Regina M. Benjamin, MD, and US Rep. Peter King (R-NY) will join Connolly as this year’s honorees.